Thank you for choosing to be part of the Aloha Crate 'ohana (family)! Your account will be billed on the 20th of each month until you decide to cancel your subscription. You'll receive an Aloha Crate every month filled with 4 to 6 goodies from Hawai'i and a product description list. 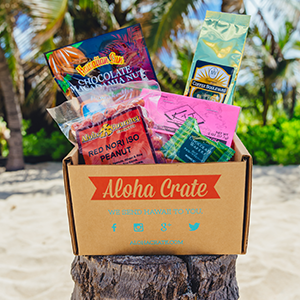 We specially curate the Aloha Crate and strive to fill it with an assortment that's sweet, savory and always a surprise! Please note that products are a mix of locally made artisan goods, non-locally made goods which we've grown up eating, and are unique to Hawai'i's diverse food culture. Aloha Crates may contain chocolates, macadamia nuts, local mustards, honey, lilikoi butter, arare and much more.